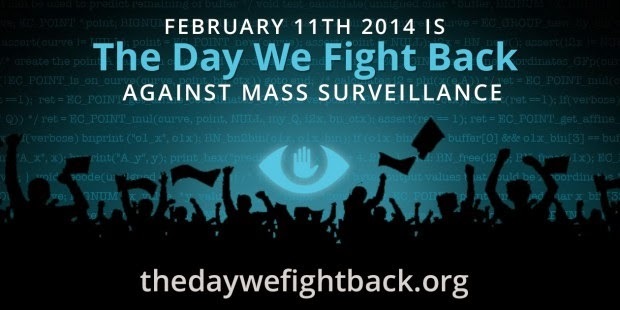 Today, February 11th is "The Day We Fight Back" against Mass Surveillance. The reason why the protest against SOPA / PIPA was successful was not just because giant websites like Google and Wikipedia did a blackout. Of course those acts were really impactful, but the reason why it was successful was because everyone took part in this movement. We should not make people think if Google and Wikipedia mobilizes, we can depend on them and do nothing- as what some of the press articles indicate. It is the efforts of "everybody" that make things happen. Many people were physically gathering to protest to SOPA / PIPA, many people made phone calls to the congressional representatives, many websites went black to protest, many developers created applications for the protest, many people worked to influence politicians and media to understand what this is, what it means, and with those massive amount of activities, SOPA / PIPA was stopped. Getting "everybody to stand up to change policies" is very important, and today we stand up and fight back against Mass Surveillance. We need to tell Congress to pass the USA Freedom Act and amend it to make it even stronger, and we need to stop FISA Improvements Act. We shouldn't wait till awful bills comes out and fight against them. We need a cycle to get great people to aim for politicians, we need everybody to support these people, we need them to propose legitimate bills, and we need everyone to support them to pass it. We should get back our democracy! 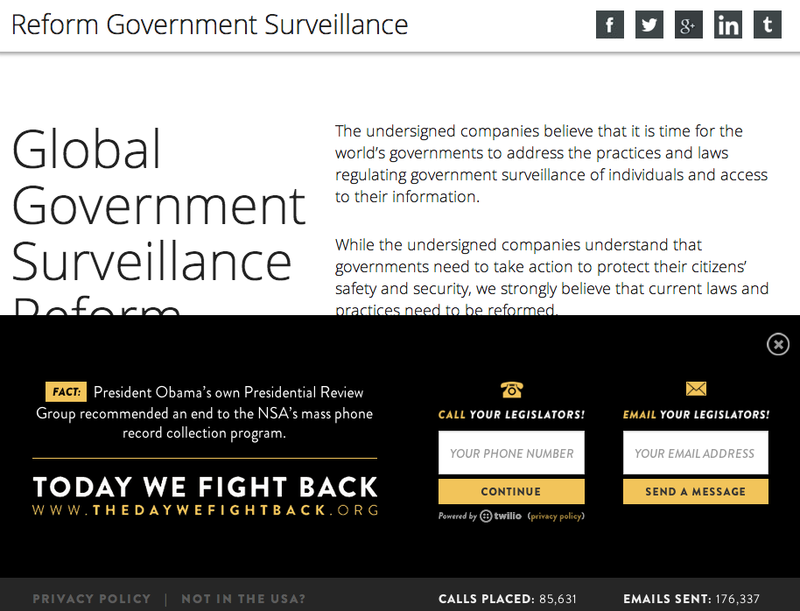 Google, together with AOL, Apple, Facebook, LinkedIn, Microsoft, Twitter, Yahoo has been proposing "Reform Government Surveillance" since December 2013, and the website added "The Day We Fight Back" as well. USA FREEDOM Act was proposed by Rep. Jim Sensenbrenner (R-Wis.) and Sen. Patrick Leahy (D-Vt.). Rep. Sensenbrenner was the lead author of the Patriot Act and now is the chair of the House's Subcommittee on Terrorism and Crime. A conservative member of Congress, he has repeatedly supported surveillance laws in the past, but now he's leading the charge for reform. According to Rep. Sensenbrenner, two consecutive White Houses have wrongly used his Patriot Act to collect the phone records of innocent Americans, and he wants it to stop. "This misinterpretation of the law threatens our First, Second and Fourth Amendment rights," Rep. Sensenbrenner recently said. "Congress never intended this. I will rein in the abuse of both the Patriot Act and the U.S. Constitution with the support of the American public." Sen. Leahy is the chairman of the powerful Senate Judiciary Committee, which also has jurisdiction over the Patriot Act and FISA. He also believes the government's indiscriminate collection of Americans' records must end, because the "government has not made its case that this is an effective counterterrorism tool, especially in light of the intrusion on Americans' privacy rights." The partnership between these two very senior members of the House and Senate, on both the left and the right, gives this bill legitimacy and a real chance at passing. But the bill has more than just names attached to it – it has substance. It would amend Section 215 of the Patriot Act – which is used to collect the phone records of almost every American every day – so that it can no longer be used in such a sweeping fashion. The secret FISA court would still be able to issue subpoenas, but they would be limited to collecting things that directly pertain to a terrorist, his associates, or his activities. The bill would also require this standard for national security letters and pen registers, two other Patriot Act tools used to access Americans' records. The point here is to ensure that bulk collection doesn't just jump to another secret authority. The bill would also make changes to the FISA Amendments Act (FAA), the sweeping 2008 law that codified the warrantless wiretapping program. It would insert a very important restriction that would prevent the government from searching through FAA-collected data for U.S. person data in the absence of an emergency or a court order. Finally, the bill includes the creation of a special advocate before the FISA court and new transparency requirements. Although the USA FREEDOM Act does not fix every problem with the government's surveillance authorities and programs, it is an important first step and it deserves broad support. It incorporates the language and principles of past reform leaders like Sens. Ron Wyden (D-Ore.) and Rand Paul (R-Ky.) and Reps. Justin Amash (R-Mich.) and John Conyers (D-Mich.), and it is far superior to the proposal recently described by Senate Intelligence Chairman Dianne Feinstein (D-Calif.), which we expect to see shortly. All members of the House and Senate should co-sponsor the USA FREEDOM Act and fight hard for its passage.